HandKrafted by Stephanie: Merry Christmas! Hello friends! I hope you are all having a blessed holiday season, and I wish a Merry Christmas to all of you who celebrate! I don't know about you, but I could use another week or so to prepare for Christmas, but it looks like all I have is 2 more sleeps. This will likely be the first year that I don't get my cards mailed out before Christmas. I figure there is no point in stressing out about that now. They will get sent when they get sent and either way it does not lessen our wishes for our friends and family to have merry holidays! I've spent the week baking, packaging teacher treats, scrapbooking with Sabrina's class at school and today is her holiday party. In a couple of hours, winter vacation officially starts! It's been a few days since I've done anything crafty, so I thought that I would make a little felt ornament for our tree. I didn't do any stamping here, but I used a few MFT Die-namics. 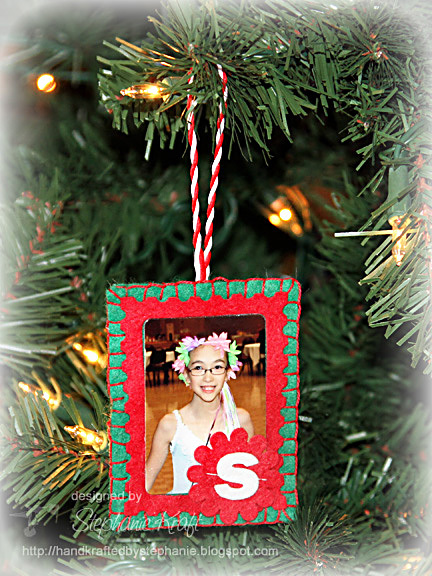 My red photo frame is cut using the Die-namics First Class Friend. I hot glued it onto a couple of layers of green rectangular felt which I hand stitched together using a blanket stitch. I used the Die-namics By the Letters to die cut the S, and stitched it onto a scalloped petal (cut with the Die-namics Perfect Petal Trio). I added a recent photo of Sabrina all dressed up for her ballet performance. Accessories: Die-namics First Class Friend, Die-namics By the Letters, Die-namics Perfect Petal Trio (My Favorite Things), Felt, Twisted Rope (May Arts), Embroidery thread, Sewing machine, Thread. Such a cute ornament!! I can't believe you guys are still in school... we've been out for a week! A very very Merry Christmas to you honey! Thanks for all your support and sweet comments on my blog!